Are Halcion Rehabs Private and Confidential? How Long Does Inpatient Halcion Rehabilitation Last? Do Halcion Rehabs Accept Insurance? Those taking Halcion sometimes refer to the drug by its generic name triazolam. Doctors only prescribe the medication for a small number of people because of its side effects. The only people who should take the medication are those with extreme bouts of sleeplessness and those who have insomnia caused by a psychological or physical condition. Halcion can cause euphoric thoughts, increased drowsiness and states of deep relaxation. According to Phillip W. Long, M.D., these effects of the drug decrease after an individual uses the drug for a period of two weeks or more. A Halcion rehab center can get you or someone you know off the drug. Outpatient clinics give addicts more freedom because the patients leave the center every day. Inpatient clinics can sometimes have a higher success rate because those facilities keep the patients away from drugs, stressful situations, temptations and others who use the drug. An inpatient Halcion rehabilitation center essentially keeps the person away from anything that might trigger a relapse. When choosing which type of Halcion treatment facility you need, weigh the benefits of each center carefully before making a decision. Call 1-888-341-7785 if you need assistance finding the right type of treatment. The moment that you admit you have no control over your Halcion addiction is the moment that you need a treatment center. A residential rehab facility for Halcion addiction provides care in a comfortable environment. You live at the center, learning how to interact with others without having drugs in your system. These programs often teach you how to do ordinary things at home without the influence of drugs. You might find yourself in the position where you do not know if you have a dependence on Halcion. When you must use the drug to perform ordinary tasks and activities, you have a dependence on the drug. If you find that you need a higher dose of the drug, you have an increased tolerance to the medication. Building a tolerance to the medication can cause dependence or addiction. High-end rehab facilities offer amenities that you cannot find at public facilities. Many of these treatment centers provide private bedrooms, while you might share a room with several other people at a public facility. This private bedroom gives you a place to relax and unwind without other people around. Private bathrooms, tennis courts, stables and whirlpool tubs are other amenities that you might find at a private facility. These centers also offer protection for clients because they never reveal information about your case to anyone outside the center. The treatment facility protects everyone, regardless of who they are. You can choose a Halcion rehab center that lasts as long as you need. If you attend a detox program, the program might last for several days or a long weekend. The point of that program is to remove the Halcion from your system quickly and safely. If you need long-term treatment, you might choose a program that runs for 30, 60, 120 or 180 days. Most centers refer to these programs as one-, two-, three- or six-month programs. The longer programs often give patients more freedom towards the end of the program such as the freedom to leave campus for a day or weekend. If you feel nervous about attending a private Halcion rehab facility, you should take comfort in the fact that these programs offer support from the moment you arrive. During the intake process, you explain your addiction and talk to a doctor about potential treatment plans. Halcion treatment programs often provide a detox program for those who need to get the drug out of their systems. Those who abuse more than one substance can seek specialized care, which treats each addiction separately. Specialized care can also help those who suffer a second addiction because of the Halcion such as those who take the medication with alcohol. For more information on what treatment entails, call 1-888-341-7785. Most Halcion rehabilitation facilities accept insurance, including any coverage that your employer offers. Your insurance might cover only a portion of the costs, which leaves you responsible for the rest of your treatment costs. You should also keep in mind that some insurance companies will only cover a certain amount of time in rehab. Leaving your family and friends behind while you attend rehab can seem difficult. If you cannot face losing your loved ones, you might pick a Halcion rehab center within driving distance of your home. This gives your family the chance to visit and attend family sessions with you at the center. If executive responsibilities have been a stumbling block you, your husband or your wife from looking for help for a narcotic or prescription drug problem or behavioral addiction, executive rehab facilities can be invaluable. 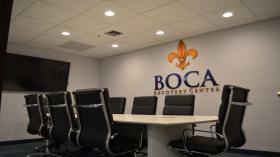 Coupling high-quality substance abuse and behavior addiction treatments with the flexibility of occasional computer and phone access, an executive can get clean and sober away from the spotlight. Many fine narcotic, prescription drug or behavior addiction treatment centers offer the luxury amenities you'd only expect in America's finest hotels, with your success and well-being being the top priorities. From gym facilities and private rooms to 5-star chef-prepared meals and fine linens, you can get the top substance abuse and behavior addiction treatment for yourself, your husband or your wife while enjoying rehab. For help searching for excellent luxury treatment facilities for Halcion addiction, dial our toll-free hotline right away at 1-888-341-7785. After you leave the rehab center, you will find that staying sober becomes a part of your daily life. Staying sober will become as normal as breathing or eating. You can use the skills that you gained at the facility to abstain from Halcion every day. Going to rehab ideally happens after the person addicted to Halcion admits to the problem. As soon as you tell yourself that you have a problem or you need help, you can begin looking for Halcion rehab facilities. Those who admit that they have a problem are more likely to follow the steps of the program. According to Time Magazine, Halcion was one of the most prescribed medications in the world during the early 1990s, with more than 7 million prescriptions written annually. The number of people abusing the medication today is still quite high, so you are not alone. There are several different treatments available for those with a Halcion addiction, including religious or faith-based treatment facilities. These programs focus on the idea that a higher power can help you find a way to stop using drugs. You can also choose a holistic treatment center that focuses on natural healing and methods that help you kick your Halcion addiction. A 12-step program is another way that some find the help that they need. These programs give users 12 steps that they must follow during treatment. As long as you are willing to admit you have a problem, you can get clean and sober. Sobriety is available from any Halcion rehab program for those who need help. You can call 1-888-341-7785 for more information today. Am I addicted to Halcion? What are the long-term effects of Halcion abuse? If you continue using Halcion, you leave yourself at risk of developing rashes, swelling of the face, vision troubles, frequent bouts of drowsiness and itching of the skin.